Yellow dock root is cooling, sour, drying, cleansing, a laxative, and bitter. Yellow dock is indicated for cases of overactive digestion, excessive appetite, excessive hydrochloric acid with reflux and burning, and an overabundance of saliva. Yellow dock is considered to be one of the best herbs for the entire digestive system. The taproot is rich in anthraquinone, which has a laxative action. It contains biochelated iron, which can be readily absorbed. It is helpful for anemia, fatigue, and for folks with PMS or other hormonal imbalances. 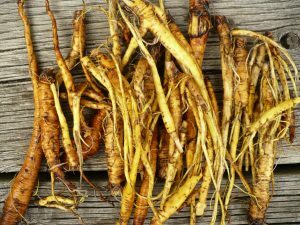 For more information on yellow dock check out this blog post from The Herbal Academy. Yellow dock is bitter, so if taken as a decoction (using either fresh or dry root) it is best when combined with other tastier herbs. It can be taken as a tincture to support the digestive system, including the liver and gallbladder. Take a couple of tablespoons of yellow dock syrup with meals, once or twice a day, to ensure good iron levels. Because of it’s abilities to regulate bowel function, this is a beloved tonic for pregnancy, it helps keep energy levels up and corrects any mild constipation. Take about 8 ounces of minced, dried yellow dock root and simmer it in a quart of spring water, over low heat, until there is only about a pint of fluid left. Strain the liquid, which should be dark brown and rich-smelling, and mix it with an equal part by volume of raw honey (e.g. two cups of fluid, mix with two cups of honey). The syrup will keep indefinitely if refrigerated.